How to estimate LV ejection fraction rapidly at the bedside , without echocardiography ? The LV ejection fraction , is the most revered medical parameter for both physicians and cardiologists.There are anesthetists and surgeons , who do not operate a cardiac patient without knowing it.There are physicians who do monthly assessment of EF in their patients with dilated cardiomyopathy. Now ,every one is interested to know what is their EF ? Thanks to the global information highway .We witness , patients who are extremely delighted when their EF increases from 45% to 48% . Similarly , they get depressed when it falls by 2% . Why this hoopla around the LV EF ? The most important caveat in EF is it’s dependence on the loading conditions of heart .It is also heavily influenced by the heart rate.We now, even a severely dysfunctional LV can contract vigorously with inotropic stimulation like dobutamine or whenever local catecholamines. Our obsession with EF is complete and it is not expected to get cured in the near future. There are many hundreds of articles in cardiology literature which ridicules the EF as sole parameter for assessing LV function. Still , it is the number one parameter to asses LV function in real world as well as in vast number of land mark clinical trials . Are all those trial results to be doomed ? Even as the LV EF is being labeled as futile index , we also realise we have not traveled far from our great clinical ancestors . Thousands of years ago the Chinese yellow emperor of medicine found the cardiac contractility by pulse volume and predicted death accurately , probably better than the live 3d echocardiography derived EF guided by LV volume rendering algorithm ! The purpose of this article is to tell the current generation physicians there are some simple and probably accurate clinical tips to rule out significant LV dysfunction. One can confidentially tell the LV EF would be > 50% in 99% of population if they have the following ! A comfortable brisk walk of at 6 km/hour for 10 m .
* A brisk central arterial pulse is nothing but the reflection of LV DP/DT a sophisticated echo parameter assessed with much hype ! A good thumb with an alert brain can accurately tell a given patients dp/dt is within normal range. ** A loud S1 and tapping apical impulse indicate the velocity of closure of anterior mitral leaflet.Which is in turn reflect the force of contraction of the antero lateral papillary muscle of LV .So what you hear a loud s1 is nothing but the contractile function of the most important part of LV namely the pap muscle of LV. While ,one can rule out signficant LV dysfunction by above mode , it can miss other forms of LV dysfunction like relaxation defect etc . (ofcourse the EF also misses it !) .Judicious use of functional imaging modalities are adviced in those who require it. Left atrium is excellently visulaised in para sternal long axis view . . . still , the vital feeding vessels to this chamber ,The pulmonary veins are never visible in this view. . .Why ? The most famous and popular view in clinical echocardiography is para sternal long axis view.It gives us an instant information about the status of left atrium , left ventricle and aorta.Left atrium appears to be seen in full. Still , one should realise it is far from truth.There is a huge blind spot for left atrium in this view . For a complete imaging of LA one need to do a short axis view at aortic level, and of course a 4 chamber view . All these three views put together , can at best give a 80% exploration of LA .The rest of the 20%( some times vital !) can be seen only be transesophageal echo . Why para sternal long axis fail to give even glimpse of the 4 pulmonary veins ? These enter the posterior surface of the LA in an oblique angle . The angle of entry is widely variable .Some times they need to run a parallel course with LA posterior wall . This makes recognition and delineation of PV from LA very difficult .. 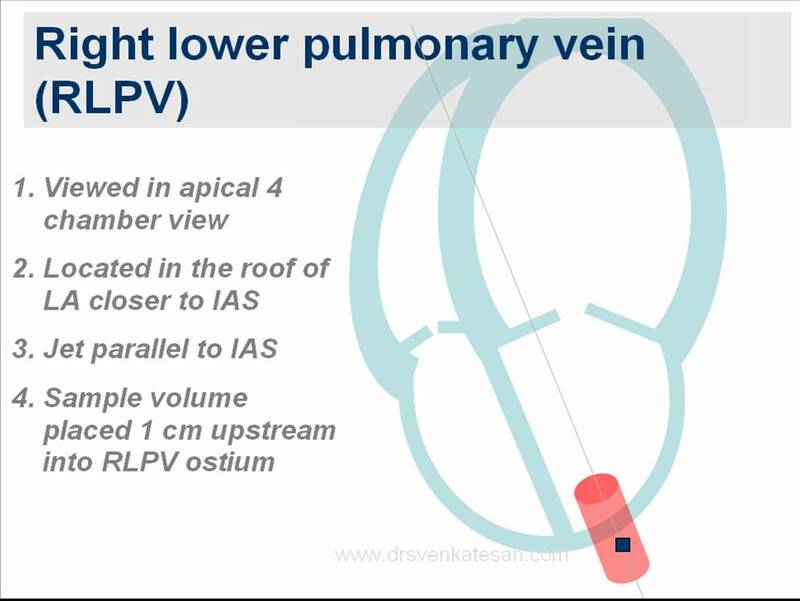 When can pulmonary veins visible in PS- LAX view ? When PVs take an abnormal course like in TAPVC or when they enter coronary sinus etc . Rarely , huge LA enlargement may pull or push the PVs and make them visible in LAX view. Great cardiology websites : This one is for cardiac radiology ! How to identify pulmonary veins in transthoracic echocardiography ? Even though it is a great vein , often the imaging pulmonary veins by echocardiography is a not a pleasant excercise. Hence no fixed imaging angle can be advised . But generally a pattern is observed. Left pulmonary vein , can be seen in apical 4 chamber but best visualised in Para sternal short axis view. TEE : Can be very useful since it is brings the vein closer to the probe .But needs more expertice. Contrast echo :Probably a simple and best modality often underutilised. Very useful to clinch the diagnosis when PVs take abnormal course as in PAPVC . MDCT , Spiral CT, MRI are the new age modalities that can provide us with dramatic 3d images of PVs. The following illustration is a gross attempt to simplify the imaging of PVs.Please note the rules may not be applicable in all. 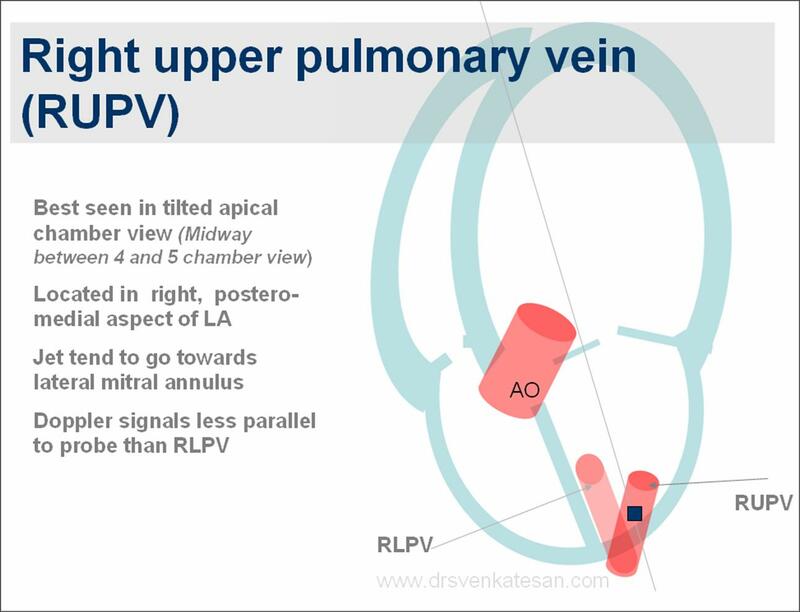 Left upper and lower pulmonary veins in short axis view will be posted shortly . A landmark study , but least popular among the interventional cardiologists ! Are the drug eluting stents really better than bare metal stents ? A study which answered most convincingly with a huge data base published in LANCET 2007. 4 year follow-up of up to 4 years. But unfortunately there is no takers for this study . The usage of DES continue to surge ahead . It takes years of research to get into the truth and still longer time for us to accept it ! Ironically falsehoods have immediate patronage and there is no incubation period ! What do we mean by membrane stabilising action of magnesium and lignocaine ? Human body is a collection of trillions of cells. Life is nothing but , a bundle of energy flowing across each of these cells .Every organ has a specailised mode of communication among themselves and others. When a cell is in an excited state , there is a likelihood of spontaneous electrical activity.This can happen in nerve cells, cardiac cells , GI tract, or virtually in any cell which has a porous cell membrane and ionic fluxes across it . Each cell membrane has a resting membrane potential . It varies between -60 to – 90mv in most cells. When this potential increases there a propensity for arrhythmias in heart and convulsions in the brain , peristalsis in intestines and so on . Drugs like local anesthetic lignociane acts by blocking the Na+ channels and there by neural activation .Similarly magesium acts on these channels to reduce the excitability of these cells.